Below you can find guides and other resources that have been created to help you get into the career of your choice. Each of the three categories has curated guides to help that specific group so make sure to locate the correct guide depending on what best suits you. Resume guide. Guide for freshmen to improve their resume. Interview Guide. Learn some of the questions you should know to go into an interview and other important interview must-haves. Cover letter Guide. Learn how to craft a cover letter that will get you your dream internship. LinkedIn Guide. LinkedIn is a vital tool for setting up your working career. Learn the ends and outs along with recommendations to have a clean and professional LinkedIn profile. 4-year Plan. 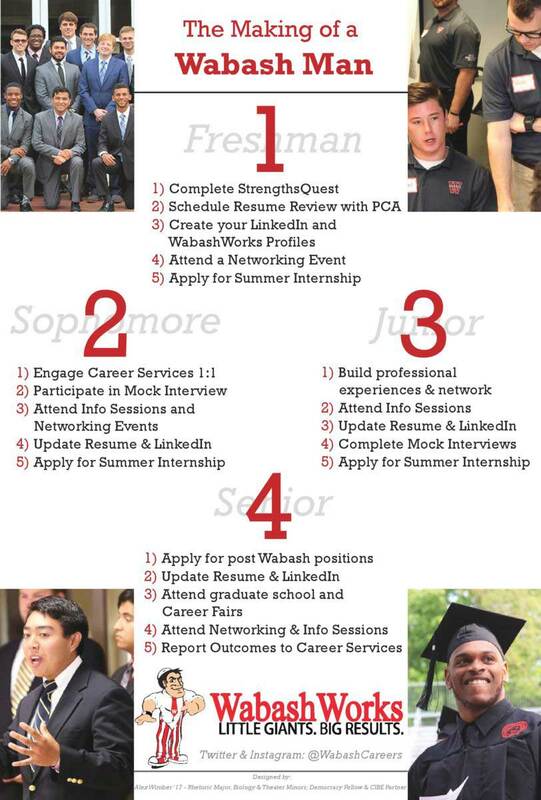 Set yourself up by learning what you should do with your four years at Wabash. Resume guide. Resume guide for upperclassmen. Cover letter Guide. Learn how to craft a cover letter that will get you an interview for a job after graduation. Letter of Recommendation Guide. Not sure how to ask for a letter of recommendation, check out this guide. Internships FAQs. Got a question about internships? Check out some of the frequently asked questions. Past Internships. Check out some of our Wabash Men's past internships. Online Learning Tools. Want to learn something outside of the classroom? Learn how to use Photoshop and other useful skills from online resources recommended by alumni, staff, and students.